"New spies with new loyalties, old spies with old ones." Time to take a look at an interesting first look photo from a film we're curious to see more from. It's the latest from photographer-filmmaker Anton Corbijn (of Control, The American) adapting a John le Carré novel yet again about spies. 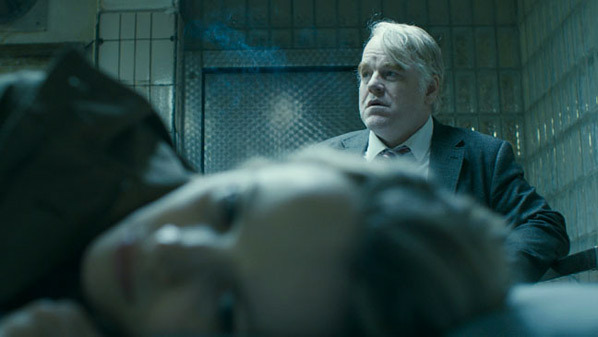 This stars Philip Seymour Hoffman as Günther Bachmann, chief of a covert German spy unit following a near-dead Chechen man on the run. Also starring are Daniel Brühl, Willem Dafoe, Robin Wright and finally Rachel McAdams, who we get a sort of out-of-focus glimpse of in this photo. It's not much to start, but I'm interested to see more. Corbijn's A Most Wanted Man takes place in present day Hamburg, Germany where a mysterious, tortured and near-dead half-Chechen, half-Russian man on the run arrives in the city’s Islamic community desperate for help and looking to recover his late Russian father’s ill-gotten fortune. Nothing about this young man seems to add up; is he a victim or a thief or, worse still, an extremist intent on destruction? Drawn into this web of intrigue is a private British banker and a young female lawyer determined to defend the defenseless. All the while, they are being watched by the brilliant, roguish chief of a covert German spy unit (Hoffman), who fights to put the pieces together as the clock ticks. It's being sold at Berlin, with no US distributor yet.